ELLETSVILLE — Dozens of people are out hundreds of dollars in tire repairs right before the holidays after someone left nails in the middle of an Ellettsville Road. Toby Cheeseman says he went searching for the source after he found nails in every tire on all three of his vehicles. Down the street from his home on Bottom Road, Cheeseman says he collected an entire bag of nails that were left lying in the road. He also found more nails nearby on Liberty Hollow Road. Cheeseman says it has cost him nearly $2,000 to replace and fix all of the tires on his vehicles. Right now, police are trying to determine whether someone placed the nails in the road on purpose, or if they got there accidentally. 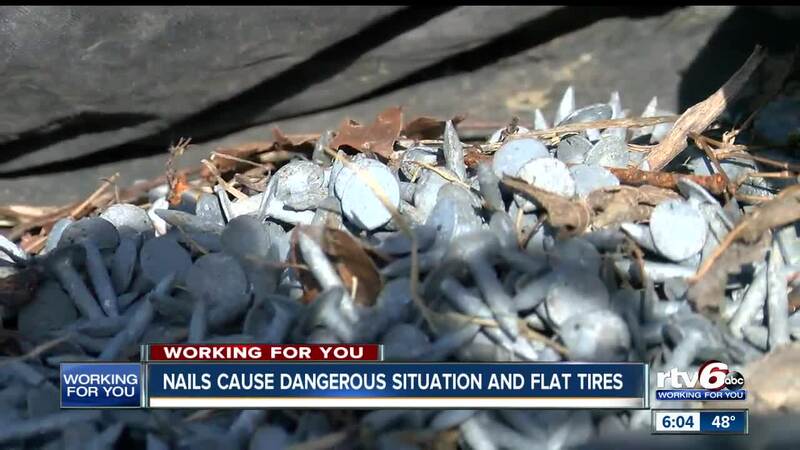 A local repair shop tells RTV6 they’ve seen dozens of vehicles with nails in their tires within the past week. The Monroe County Sheriff’s office is investigating the damage and says they have also received several reports. They’re encouraging witnesses or anyone who has had a nail in their tire after driving down Bottom Road to come forward.